Lower back pain is one of the most common musculoskeletal problems that is experienced in Australia. It can be defined as acute (lasting up to 4 weeks), subacute (4-12 weeks) or chronic (more than 3 months). This blog will discuss some of the reasons why our lower backs can become painful, 2 common conditions and preventative measures we can introduce to prevent lower back pain. Why do our lower backs become painful? In a clinical setting, we commonly see people in pain, particularly due to their lower backs. There is a wide variety of how people present and everyone has their own (or combination) reasons why they are suffering from lower back pain. Lower back pain may be caused and influenced by physical and/or psychological factors. Physical factors include poor posture, limited exercise, direct trauma, poor muscular strength, limited joint flexibility and particular occupational duties. Psychological factors may include mental wellbeing and previous beliefs regarding injuries. We will discuss 2 different examples of physical factors which can influence lower back pain. Degeneration involves age related “wear and tear” to the bones, joints and discs of our lower backs. These changes can create some stiffness, limited movement and weakness through the joints and muscles of our spine. These changes within our spine may lead to lower back pain. Lower crossed syndrome is a result of muscle imbalances within the body which can cause lower back pain. 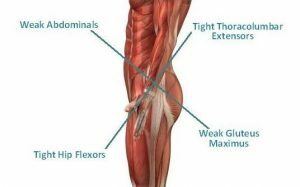 It presents with underactive and weak gluteal and abdominal muscles, together with tight and overactive thoracolumbar extensors and hip flexors. Posture – a focus on your posture can go a long way to preventing lower back pain. Prolonged poor posture can place a large amount of load and stress on our lower backs. Support your spine with appropriate ergonomic chairs and desks, prevent long periods of being stationary, and make sure you bend and lift items by flexing through the hips and knees. Exercise – staying active is very important to keep our bodies fit and healthy. Combining regular aerobic exercise with some resistance strength training throughout the week is a great way to keep our lower backs mobile and strong. If you are playing weekly sport, ensuring you spend time warming up is very important. Flexibility – including some regular stretching into your week can be very beneficial to keeping your spine mobile and pain free. Mobility exercises like the “cat cow” and “thread the needle” are excellent exercises for the lower back. You can add equipment such as foam rollers, spiky balls, massage balls to add variety. Alternatively, you may choose to attend a regular yoga or pilates class. Osteopathy – is a holistic patient-centred approach to treating musculoskeletal conditions. Osteopaths use a range of hands-on techniques (e.g. manual therapy, soft tissue massage, stretching, etc.) to decrease lower back pain, increase range of motion and improve overall wellbeing. Exercise Physiology – specialise in clinical exercise interventions for people with a broad range of health issues. Exercise physiologists use exercise based interventions, as well as lifestyle modifications to resolve and prevent lower back pain. 6. Overall Health – a focus on your general health is important to preventing lower back pain. Aiming to maintain a healthy weight by eating a clean diet, drinking plenty of water and getting adequate sleep each night. Also, you should avoid harmful products like alcohol and smoking.